The WIT African Society held their annual African Day on Thursday 23rd March. The event started at 10am with a number of society members showcasing various African cultures answering questions from students and staff. There was a fashion show at 1pm where members of the society modeled clothing from Africa. On the day the society had DJ Fabdu and host David Omotade on hand to create the right atmosphere by playing music and getting the crowd in involved. One of the highlights of the day was when the Black Illusion dance group took to the stage. The guys brought a great crowd with students and staff amazed by their unique moves. Overall the day was a great success bringing great character and vibrancy to the college. We would like to congratulate the African Society on hosting a great day enjoyed by all and we look forward to seeing what they will bring to the stage next year. WIT Athletics Club will descend on CIT this weekend for the IUAA Intervarsity Outdoor Track and Field Championships. This is a two day event and WIT will have a squad of 24 athletes competing covering over 40 events over the weekend. Scholarship athletes Shaun Donohue and Denise O Connor will look to impress and lead the team on. The Business Society is proud to announce that their annual Business Ball will take place in the Tower Hotel on Wednesday April 26th. This years theme is Alice in Wonderland. We would like to wish all involved in organising the event the very best of luck. The Drone Club is a newly established club within Waterford Institute of Technology. Cian Shaibo has been the main driving force behind the club and he took the opportunity to work alongside the BYTE programme on Wednesday 29th March in the sports hall on the cork road. The BYTE programme is run by engineering students who are looking to broaden their third level experience and they participate in various activities each week. Cian, chairman of the club, gave an introduction to Drone racing to the students before showing them the basic skills on how to use the drones. After spending some time practicing the students were ready to race. They competed against each other in a drone racing game and they thoroughly enjoyed their experience on the night. The club meets up on Thursday evenings in the WIT Sports Hall on the Cork Road campus at 5:15pm. Thursday 16th March saw WIT Clubs and Societies join up with the WIT GAA Club to welcome students from Norway and Sweden to a Hurling workshop. This exhibition took place on a fine sunny day out on the astro turf pitch in the WIT Arena. In total 70 students took part. The first group of 35 were very eager to learn the skills and rules of the game. A demonstration of all the basic skills of Hurling were first shown; roll and pick up, pick up on the run, ball striking, blocking, hand passing and dribbling. With the sport of Hockey being a popular sport in Norway and Sweden, some of these complete beginners showed great ability to quickly adapt to the sport. The workshop ended with a long puck competition, some of the students even managed to reach the half way line, which is a great achievement having only practiced for such a short while. After this, it was then the second’s group turn. Once again, this group had great intent and were very eager to try better the other half of their class having watched the first session. Truth be told, both groups really exceeded expectation for their first time playing Hurling, and more importantly great fun was had by all. Wednesday 8th of March saw the commencement of WIT's Ladies GAGA programme. This is an initiative by the Munster GAA Council to try and increase interest in recreational Ladies Football amongst the Third Level community. Numbers started off small with 6 there the first night. However this was ideal as it was a great chance for some 1-1 coaching for the girls involved. During the session, a rundown of the basic skills were thought and practiced through various drills. The session ended with a 3v3 game scenario for a bit of fun. Wednesday 15th saw numbers increase to 8 and skills had already reached the next level for those who came the first night. With word spreading of these fun and healthy training sessions, we are expecting a further increase in numbers this week. All are welcome to come the WIT Arena at 6pm. Finally, it is indoors so no need for boots either! 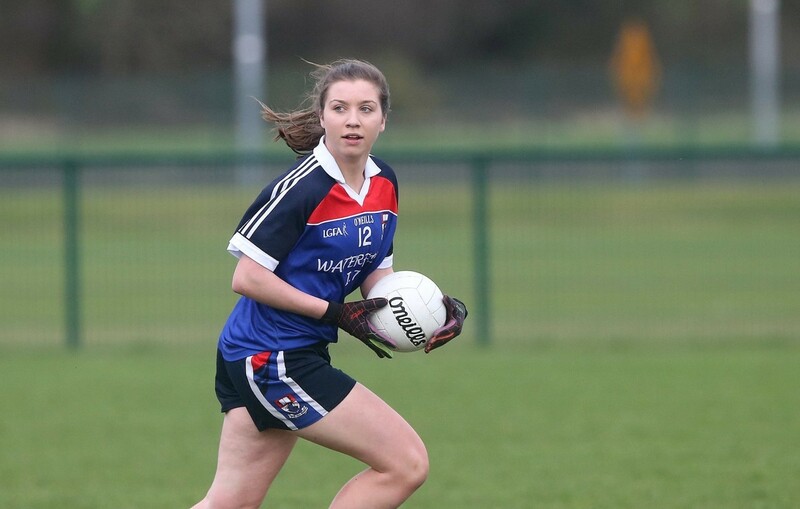 The WIT GAA Club would also like to congratulate Ladies Football player Mairead Daly on receiving a Higher Education Ladies Football All Star Award on Friday last. The Offaly native certainly deserved this prestigious honour having been a key player for the College throughout this year’s successful Lynch Cup Campaign. Well done Dalo!!! Engineering Society Mechanical & Manufacturing Student trip to Berlin. February 2017. In September 2016 Waterford Institute of Technology’s Engineering Society decided to organize a trip to Germany for semester 2.The group extensively planned, costed and organized the trip themselves led by two fourth year Students Lee Cogley and Martin Gilbert. The vision was to go on a plant tour in the BMW bike manufacturing facility in Juilusturm Berlin and the VW plant in Wolfsburg. On the 6th of February the 22 Mechanical & Manufacturing Students left WIT at 4am and arrived in Berlin midday. They stayed in a hostel which was centrally located. A number of Lecturers met up with the students and participated in the plant tours. The hip hop society are currently working on routines for an original song they recorded called Entertainment. They are planing on shooting a video where they will include individual and group moves that they have perfected in training. The group meets up every Wednesday evening from 6:30pm-7:30pm in the Dance Studio in College Street and are always looking for new members who are enthusiastic and eager to learn. Our Ladies Basketball team travel to Trinity in Dublin on Friday 7th April to defend their Inter varsities title which they won in extraordinary fashion last year. Brittany Dunbar who has starred for the college in recent games will be absent from the line up as she picked up an injury resulting in her missing out on the Inter varsities weekend. WIT will face NUIG and DCU on Friday before their final group game against DIT takes place on Saturday. We would like to wish the team and their coach Jim Dudley the best of luck and hopefully they bring a trophy back to Waterford. The ladies soccer team travelled to Cork on Thursday 23rd March to compete in the annual Intervatsities competition which was hosted by University College Cork. The weekend was attended by 12 colleges all competing for the prestigious shield, plate and cup trophies. WIT took to the field at 2pm on Thursday afternoon to take on IT Sligo in the shield semi final. The opposition came out of the blocks fast and hard. After soaking some heavy pressure the WIT ladies were down to ten players when Gillian McKenna received her marching orders after her second yellow. The team adapted to only having 11 players quickly and defended as a unit and attacked on the counter, forcing the Sligo keeper into some great saves. The dead lock was broken in the first minute of the second half when Sligo scored a spectacular worked goal. After that and for the remainder of the game it was the WIT ladies who played all the attacking football while Sligo used the extra player to defend and soak up all that WIT had to throw at them. The game finished 1-0 to IT Sligo, which meant next up was a 3rd/4th place playoff on Friday against another premier team, Carlow IT. The game was played in glorious weather on Friday afternoon where WIT looked to be the stronger and the hungrier team in the opening half. Twenty minutes into the game it was the captain, Rachel Hutchinson’s determination that drove the WIT girls on. Rachel passed several opposition players and sent in a cross that was met in the box on the head of Wexford Youths Chelsee Snell who drilled the ball home to take the lead. Five minutes later and again it was Hutchinson on the ball, only this time she took the shot on herself from outside the area, drilling it into the back of the net. After the break Carlow defended well and restricted the number of chances that fell to WIT. Carlow did however pull one back near the end of the game but it was not enough to stop WIT winning and taking 3rd place. The game was a special game for Rachel Hutchinson as after playing four years in college and captaining the ladies’ soccer team, this was to be her very last game for WIT. It only seemed fitting for her to assist the first goal and score the second to win the game. After the final whistle, Hutchinson stated that, “the game felt like a testimonial game”. Later that evening at the awards banquet Rachel was named on the Team of the Tournament for her tremendous performance at the weekend. The societies first photo exhibition took place last week in the White Atrium on the WIT Cork Road Campus. Members of the society showcased some of their amazing photographs. The committee would like to thank everyone who helped organise this exhibition. It was wonderful way to end a very successful first year for WIT Photography Club. The WIT Sports Scholarship Office hosted an evening with freshly named six nations and WIT graduate Alison Miller last Wednesday 29th March. A really enjoyable and insightful evening was had listening to Alison share her experiences and speaking on issues on mental health and sport. Alison spoke about grabbing opportunities that can be sometimes getting away from you, the opportunities that can come through adversity and the importance of finding a balance between life and sport helping to keep perspective on the bad days.